To get this to work, you only need to download the latest gnome panel source from here apply the patch and compile it, and that's it. 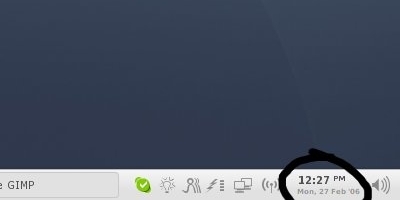 I realy like the way you made Your clock look, but could You tell what is the gnome-panel version You are using atm. Yay >.< it works! Big Thanks to You! Big Thanks to Andrei Goaga (GX10) for allowing me to use his "Dude" :) (Green dude on the up right corner). Thanks a lot!